Jump into the digital age without the costly upgrades. 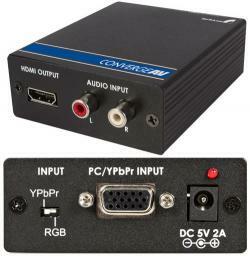 Allows you to convert analog audio and video to one HDMI cable. A great way to view content stored on your computer on your HDTV, now you can enjoy multimedia the way it was meant to be seen and heard. This HD/VGA (with Audio) to HDMI format converter is a great way to wow your audience with the full power of digital content.